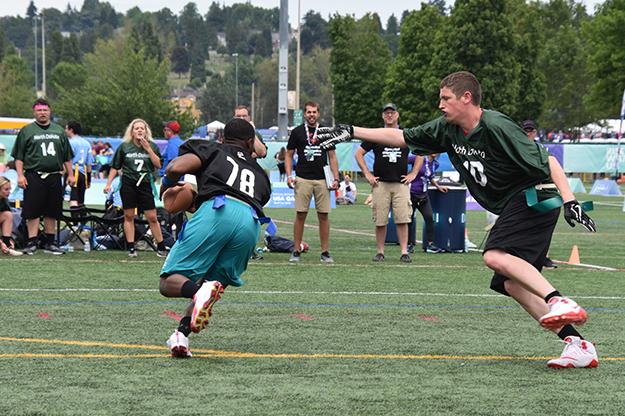 Michael Storandt, a second-year medical student at UND, went to the Special Olympics USA Games as a coach of the Unified Flag Football team for North Dakota. A volunteer for the past seven years, Storandt was also selected to lead the Coaches’ Oath during the Opening Ceremony. Occurring once every four years, Storandt was humbled to be selected for the on-stage role. Image courtesy of Kaia Watkins. Through his work with Special Olympics North Dakota, Michael Storandt would say that he isn’t volunteering. He’s doing something he loves. Since coaching a youth basketball team as a junior in high school, the Moorhead, Minn., native and second-year medical student has spent the past seven years working with the Special Olympics organization and its athletes. At UND, he’s been a trailblazer in developing competition for the collegiate age group. 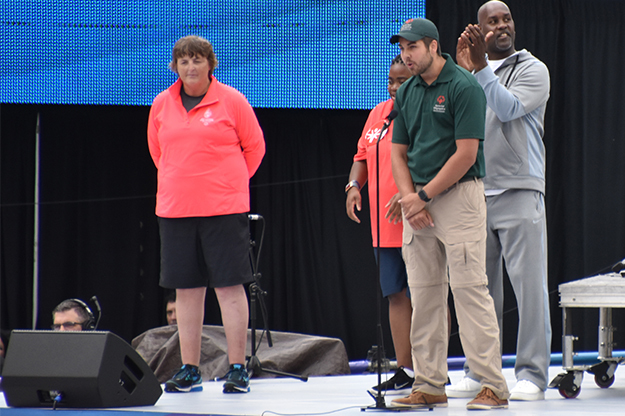 This month, at his first trip to the USA Games, Storandt was bestowed the honor of reciting the Coaches’ Oath during the Opening Ceremony. Storandt shared the stage with athletic dignitaries and pop culture fixtures alike. 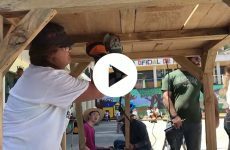 The ceremony was broadcast live on ABC, and the University of Washington’s Husky Stadium in Seattle, Wash. was full of spectators and more than 4,000 athletes. “It was amazing, and kind of nerve-wracking,” he said about briefly leading the ceremony. “There’s 20-30,000 people staring back at you, but it was a cool opportunity. Despite all of this experience and growth through his passion, Storandt knows people who were far more deserving to deliver the Coaches’ Oath. Since coaching a youth basketball team as a junior in high school, the Moorhead, Minn., native and second-year medical student has spent the past seven years working with the Special Olympics organization and its athletes. 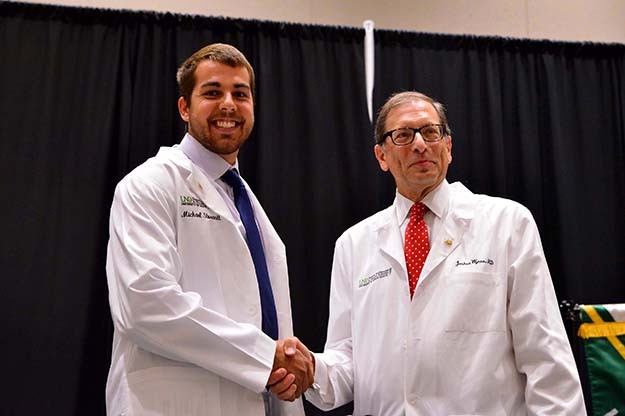 (Above) Storandt is congratulated by UND SMHS Dean Dr. Joshua Wynne, after Storandt donned his white doctor’s coat for the first time. Image courtesy of the SMHS. Kathy Meagher, President/CEO of Special Olympics North Dakota, met Storandt when he was still an undergraduate student at UND. Now that he’s pursuing a medical degree from the School of Medicine & Health Sciences, she’s amazed how he finds the time. Meagher also indicated it’s something that runs in the family, as the Storandts show up at state competitions to volunteer on a regular basis. He says that once he found that, and put the effort in, there was no way he could live without it. “It’s that important to me,” he added. Storandt’s flag football team was unable to secure a win during their national run, but coaches and leaders at the Games praised their style of play. 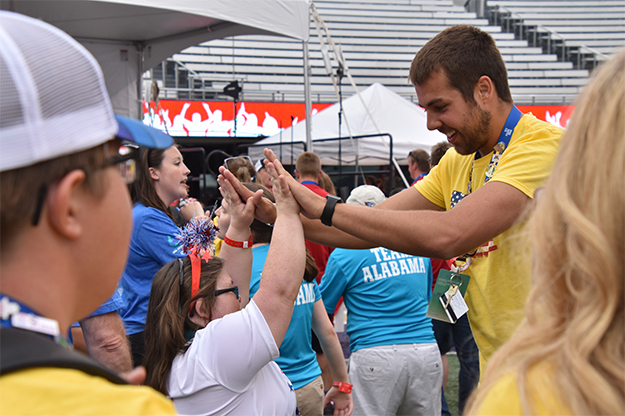 In “unified” sports, those with and without intellectual disabilities take the field together, and Storandt made sure everyone had a role in the outcome of competition. Image courtesy of Kaia Watkins. Storandt coaches a Unified Flag Football team. In Special Olympics, “unified” refers to the team structure. Athletes, those with intellectual disabilities, share the field with partners, people of the same age group who don’t have intellectual disabilities. On the flag football team, all four of the partners are UND students or recent graduates from the University. Storandt illustrated how unified sports such as flag football create a more inclusive environment. 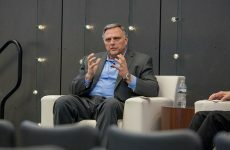 Developing such connections have been crucial to Storandt’s education, as there’s only so much to learn in the classroom. When Storandt arrived on the scene, UND’s chapter of Special Olympics College Club was a fledgling program and the only SO College Club in North Dakota. Three years later, it has a presence on almost every North Dakota campus. He coaches flag football and youth basketball, but also plays as a partner in volleyball and soccer. Storandt led the coaches in their oaths during the Opening Ceremony, an occasion that drew nearly 30,000 spectators to University of Washington’s Husky Stadium and was broadcast live on ABC. 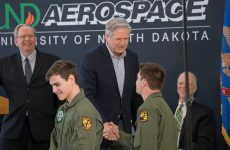 The UND medical student said the moment was somewhat nerve-racking, amazing and an opportunity to represent the state. Image courtesy of Kaia Watkins. Storandt says that everything surrounding the 2018 USA Games has made the past week one of the greatest of his life. The flag football team went 0-6 during their national run, but Storandt said their style drew attention and praise. When asked how his work with athletes relates to his path through medical school, Storandt pointed to the awareness it creates. Though he has a lot of time to change his mind about his career, it’s almost certain Storandt’s work with Special Olympics will continue. He encourages anybody and everybody to come to a practice.